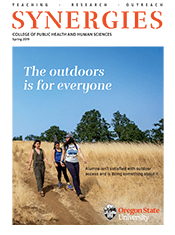 The College of Public Health and Human Sciences’ Health Extension is continually working to make Oregonians healthier through its nutrition outreach. Lifetime Fitness for Health (HHS 231) directors are taking a new approach to the course and are redesigning it to better meet students’ needs. The results of this study are promising, and show that simply building movement into everyday activities can have meaningful health benefits.